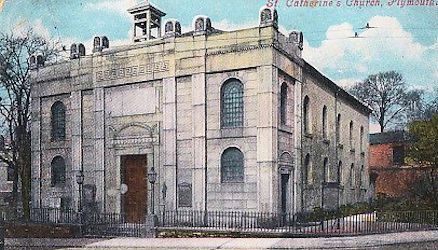 The Anglican Church of Saint Catherine of Alexandria, Martyr and Virgin, formerly known as Saint Andrew's Chapel, was situated in Lockyer Street, on the way up to Plymouth Hoe. The Plymouth Register Office now stands on the site. The Anglian Church of Saint Catharine of Alexandria. This was originally a chapel of ease to the Ancient Parish Church of Saint Andrew the Apostle and was a plain building of stone and granite in the Basilican style. It was opened in October 1823. © Western Morning News Company Limited. 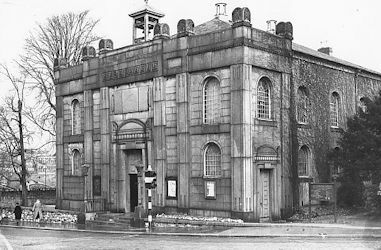 Designed by Plymouth architect, Mr John Foulston, it consisted of a chancel and nave and the cost of construction, £5,000, was donated by the Reverend Lampen, who was its first incumbent. There was a small belfry containing a single bell, surmounted by a cross. It had an altar-piece by Ball, the architect of the Anglican Church of Saint Luke, which represented the Crucifixion, apparently towards the close of the Three Hours of Darkness indicated by the return of daylight on the verge of the horizon. The Church was restored in 1879-80, when it received new oak stalls and a new organ chamber; a choir vestry was added in 1907; the roof was renewed in 1912; and other repairs were executed in 1914. There were 800 sittings. Mr Norman Holme and Miss Margaret Lorimer Weir were the last couple to get married at Saint Catharine's on Wednesday November 27th 1957. The Vicar, the Reverend W H A Cooper, officiated. Mr Holme was a member of the scientific staff at the Marine Biological Association on the Hoe. Plymouth City Council acquired the site and remains of the Church and School in October 1958 for £23,000. The cost of demolition was expected to be £773. The last service to be conducted at Saint Catharine's was the funeral of one of the congregation's oldest members, which took place on Thursday November 28th 1957. On the following day van loads of furniture were removed to the Anglican Church of Saint Andrew the Apostle and the organ was returned to its maker. Many of the fittings found their way to the churches being built on the new housing estates, the pews being installed in the Anglican Church of the Ascension at Manadon.